Days of Discovery: Tales of Danger #1 plays with some of our favorite things - multi-use cards, layered decisions, and clean set collection/hand management gameplay. While it can drag at higher player counts, Matt Worden's most ambitious project to date is a fun, unique take that delivers on everything it promises...well, except the 'danger' part. Days of Discovery: Tales of Danger #1 is the first in a new series of games by indie designer Matt Worden. 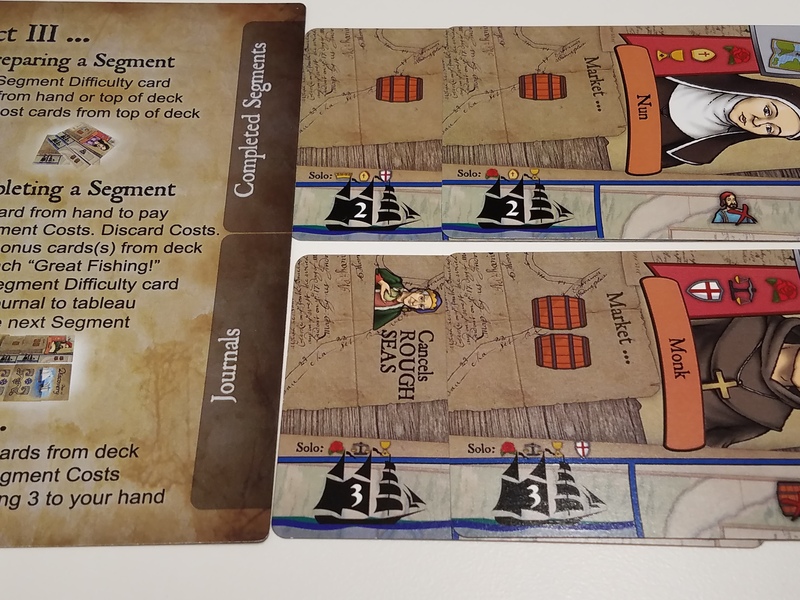 Up on Kickstarter right now, Days of Discovery takes on the lofty challenge of translating the thrill of setting off on an adventure into the unknown and distilling it into nothing more than a deck of cards. Matt Worden has managed to make car racing fun, so I think he’s probably capable of anything, but how does Days of Discovery hold up? Let’s get this Kickstarter Preview started so we can discuss! Describing Days of Discovery in broad strokes is both easy enough and yet also a bit misleading. 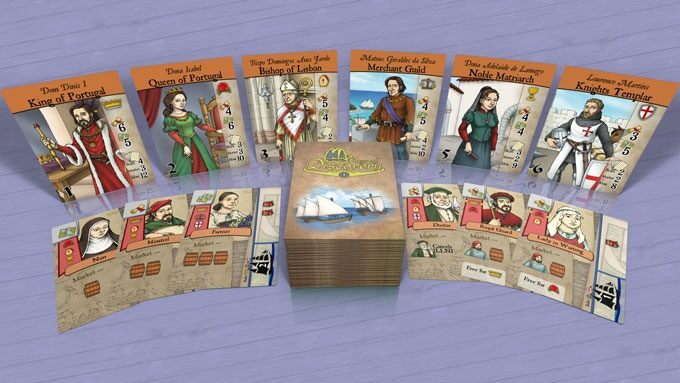 At its core, Days of Discovery is a hand management/set collection game, where players are all explorers who are preparing to seek glory and fortune by setting sail into the unknown. However, immediately, we must caveat that Days of Discovery is really three games in one – the arc of playing Days of Discovery moves through three distinct acts, which each represent different challenges that these explorers faced, from securing funding and sponsorship, to gathering crew and supplies, to undertaking the journey itself and dealing with the dangers found therein. The first and foremost consequence of this rather unique take on game design means that each and every card in Days of Discovery serves three purposes, which is something we think is really neat. But it also factors into the strategy, because cards used for one purpose will be unavailable for others. Jess: Right off the bat, we’ve got something really interesting here. We’ve played a lot of Matt Worden’s games and they all tend to be simple yet satisfying affairs. This is definitely his most ambitious project so far. Andrew: No doubt about it. Days of Discovery: Tales of Danger isn’t just the most complex game to come out of Worden’s designs, but it’s the beginning of a series of games! Jess: Actually, you brought up something I wanted to discuss. ‘Tales of Danger’? Really? Andrew: Heh, yeah, I know where this is going, but let’s get to that in a bit. The 3 Act structure of Days of Discovery works like this. In the first act, each player is trying to secure a sponsor. This is done through a series of card drafts designed to build a specific hand in order to attract a sponsor. Each sponsor has certain requirements that they need in terms of evidence and plans they need in order to be convinced to support your endeavor. 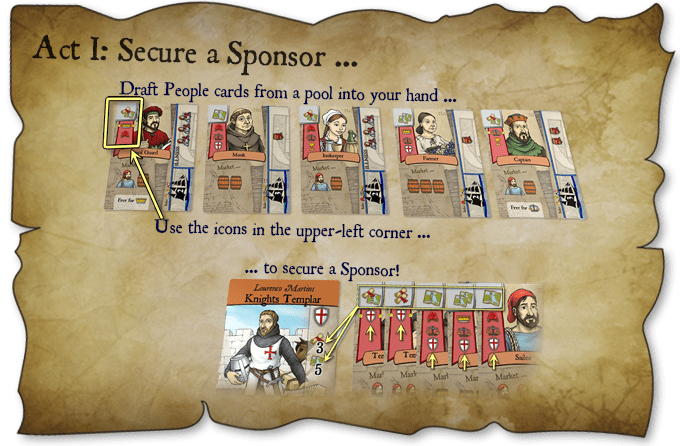 Some are easier to convince than others, though the more difficult to secure sponsors also have deeper pockets, letting you get into a better position for Act 2. Andrew: My gripe here was that, in addition to the Plans and Evidence you’re collecting, you also need to get a hold of an ‘insider’ for that sponsor – a card that evokes the favor of the sponsor you’re looking to secure. This proved to be an annoying little barrier that didn’t add much tactical interest but did make things more random in an already mostly random part of the game. But it was a minor issue. 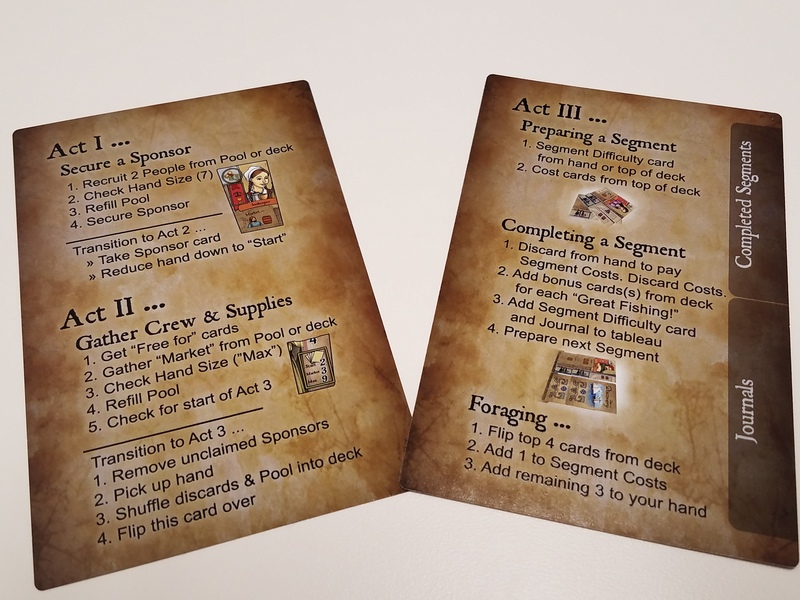 In Act 2, the sponsor you’ve secured will dictate how many cards you get to keep of those you’ve gathered, so planning ahead is important. 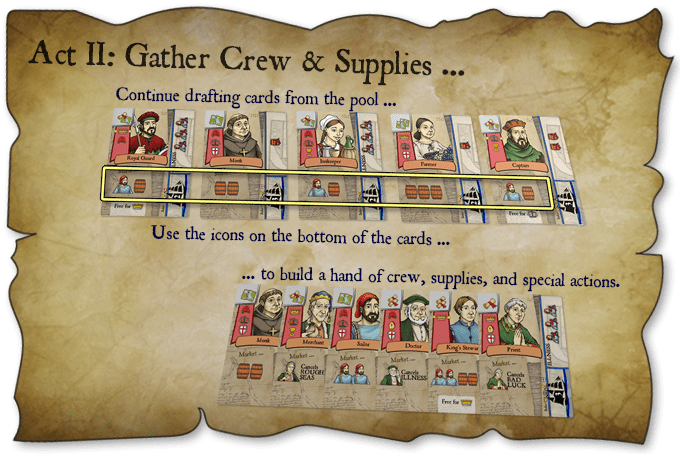 In this act, the draft shifts from gathering cards with Evidence and Plans to focusing on the crew and supplies they offer. Again, the power of your sponsor comes into play here, as they will dictate your max hand size for this phase. 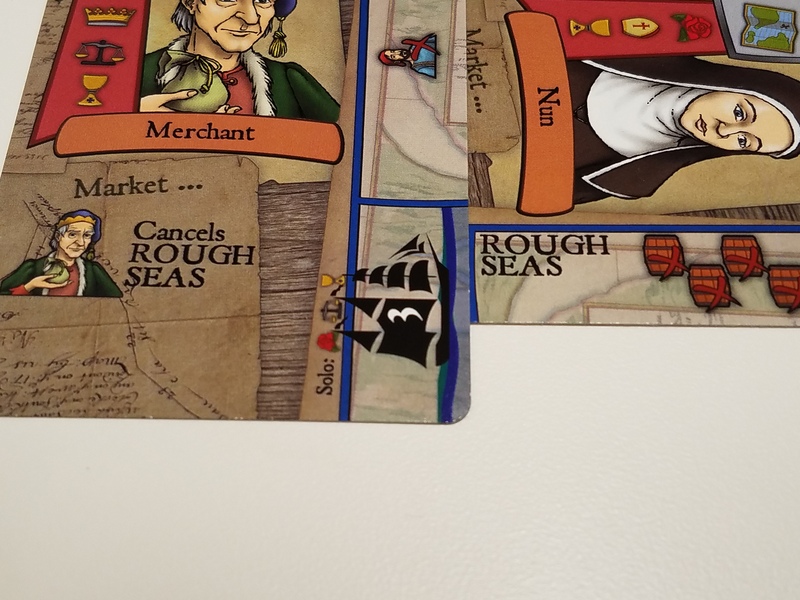 The Merchant can bypass Rough Seas, which would otherwise cost you a boatload (hah) of supplies. In addition to crew and supplies, you’ll also want to consider taking on characters who can nullify certain disastrous events which might befall you during Act 3. Of course, each card taken eats up valuable hand space, and there’s always the chance you might not draw those events, so it’s a matter of assessing the risks involved. Finally, in Act 3, players will set sail for the Land of Danger! Jess: Ok, seriously, can we talk about that yet? Andrew: One sec, almost done. 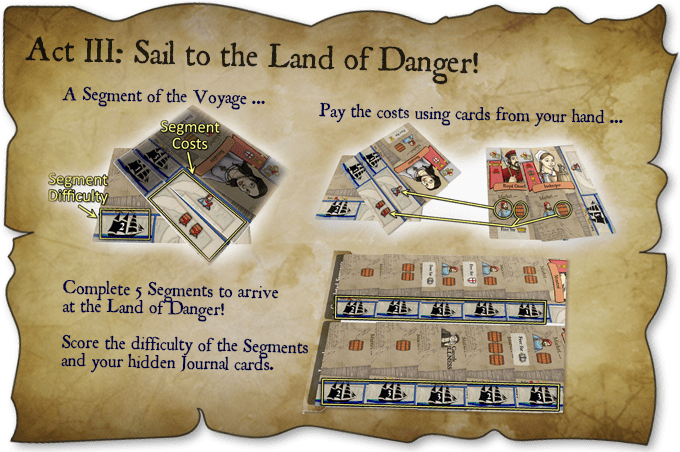 In Act 3, gameplay shifts from card drafting to full on hand management, as your ship will endeavor to cross the ocean while still remaining intact. Each round, you’ll likely lose men and burn through supplies, so you’d better hope you packed well in Phase 2. 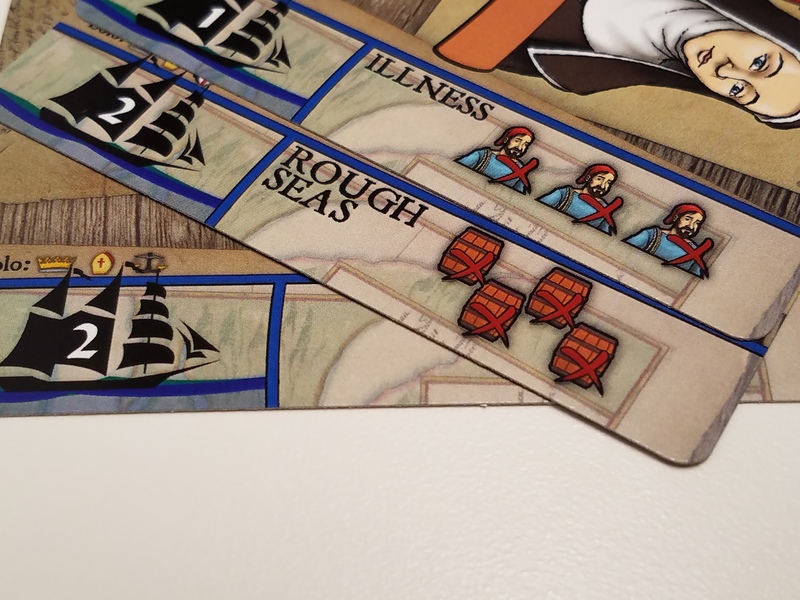 While some good fishing might allow you to replenish your hand to a limited degree, disasters like rough seas and illness will rip through your reserves (unless, of course, you have the crew who can cancel them). 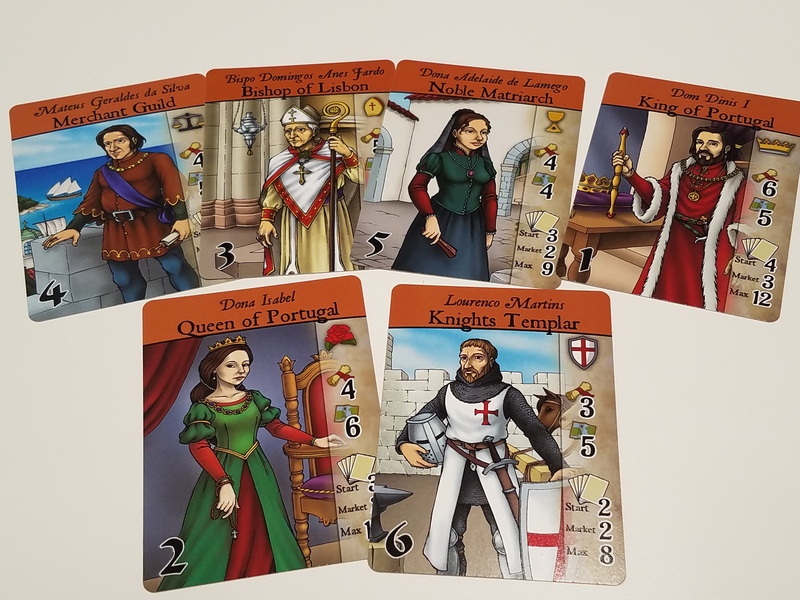 In addition to the points you score from the segments you endure, you can also add cards to your ‘journal’, which contributes extra points…but that, of course, assumes you can spare the cards to do so. That’s not nearly always the case. Ultimately, the more challenging the journey you undertake, the more points you stand to accrue, and at the end of the journey, it is the player with the most points who wins Days of Discovery! Jess: THERE WAS NO DANGER! I mean, ok, there must have been some danger to the crew in Act 3, I guess, in that the vast majority of them died, but the title sets up this weird expectation that the game makes no attempt to meet! Andrew: I absolutely agree with you. It may seem like a silly thing, and I know it’s been tacked on to the title of the game for the purpose of tying it to the later games in the series, but this is not a Tale of Danger. It’s a Tale of Marketing And Coordination Meetings, for the most part. Jess: But that aside, I think Days of Discovery is really neat! It’s not a complicated game, really, since it’s almost all card drafting, but I really did like how your choices in one Act carried over to the next leg of the game. Andrew: It really let you be as strategic as you wanted to be. At the end of the day, figuring out which cards were the most valuable wasn’t particularly difficult, but it was at least interesting trying to decide if (and how) you were going to keep the cards you wanted while still meeting the shifting priorities of the three different phases of gameplay. There’s a lot to recommend in Days of Discovery. Worden makes pretty masterful use of the multi-use cards, and while it definitely lags at the higher player counts, it makes for a solid 2-4 player game. There’s something unique about Days of Discovery – the way the three phases of the game interlock means that every decision you make has multiple consequences, and learning the ins and outs of that interplay is the heart of the game. Andrew: I really enjoy the layered strategy at work here, and it’s definitely the most ambitious of Matt Worden’s projects so far. Jess: For sure. When it first hit the table, it was a lot to take in, but once we got rolling it all ran pretty smoothly. And even though I can’t help but give it a hard time about the whole ‘Tales of Danger’ thing, I’m excited to see where the series goes from here! Good player aids are indispensable for a game like this. We think Days of Discovery is totally worth checking out. 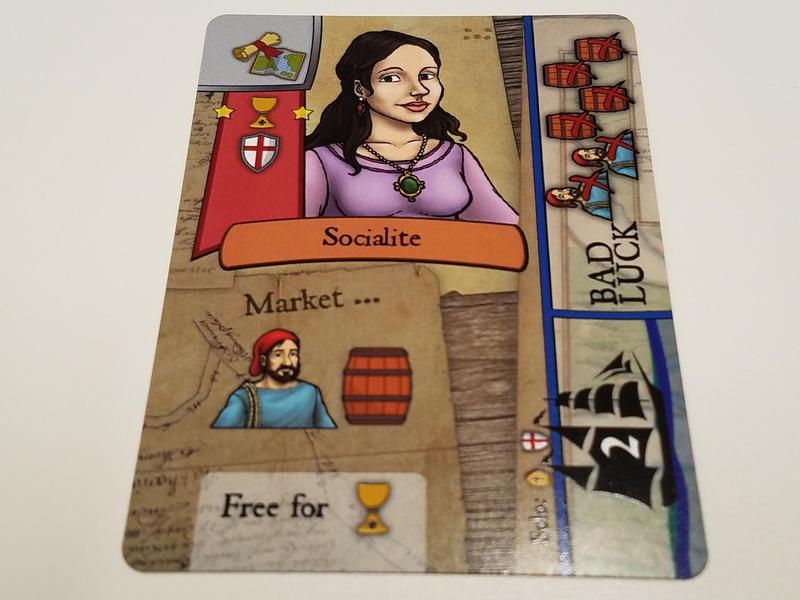 Up now on Kickstarter and running strong, we think that if you’re in the market for a clever hand management game, Days of Discovery is definitely deserves a look!